Virginia Commonwealth University in contingency with Shoulder to Shoulder, Inc. and Fairfax Family Practice afforded me the exceptional and unique opportunity this year to engage as an active member in an incredible collaborative effort focused on the empowerment for sustainable health and well-being of the people in the department of Intibucá in rural Honduras. As a physician from the United States where we are given, in comparison, the luxuries of modern medicine, it is incredible to see the degree of disparity in healthcare affordability and accountability. The goal of our trip this, as with each year past, is to help sow and cultivate community involvement in achieving a sustainable healthcare infrastructure while addressing local health concerns and the basic resource needs. This year I was heavily involved in the Child Healthcare Initiative Program or more commonly known as CHI which encourages the local school system and families within the region of Intibucá to engage in endorsing good health habits while documenting and tracking children from year to year to assess physical growth and address deficiencies in pediatric health needs. The domains we address are physical growth (i.e. height, weight, and arm circumference) to evaluate mean caloric intake, anemia management, general physical and mental well-being, vision screening, preventative medicine (i.e. parasitic infection control and vitamin A deficiency), and dental care (which is a significant marker of health status). 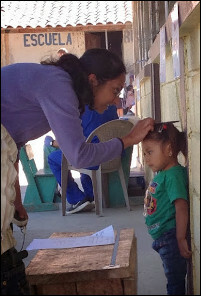 Vitamin A deficiency and anemia have been recognized as a significant public health concern in Honduras among children age 12-71 months of age by a National Micronutrient Survey conducted in 1996 thus the mass effort to address these particular deficiencies. I, in contingency with several other brigade members, set up stations each designated to address each domain mentioned above. Working as a provider at many of these stations afforded me the opportunity to engage with the school teachers and parents who are part of the community and function as a cornerstone to endorsing a viable community based healthcare enterprise. I learned a great deal about a vast majority of where the inconsistencies exist, by firsthand accounts and was allowed to engage conversation and dialogue about preventative medicine as a construct of community level involvement in the healthcare infrastructure. We are very much limited in our resources however have been this year as in years past to accomplish a great deal in breaking health disparities to achieve a more sustainable environment for healthcare advancement in rural Honduras.